Some of the most beautiful places on the planet deserve a lot of pictures, and so there are a lot of pictures in this post. 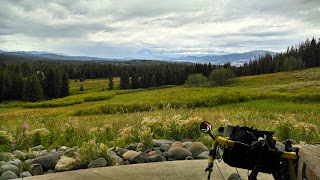 A much needed change after the Ft Nelson to Grande Cache stretch of riding. I made a stop in Jasper for food and WiFi and left quickly. After a couple days of long remote rides and a mediocre night's sleep the tourist crowds seemed overwhelming. I felt both tired and excited as I pedaled down the Icefields Parkway, one of the most scenic roads in the world. Just outside of town a black wolf ran across the road ahead of me. Awesome. Darren and Darren, the Professors. I left Ft. Nelson feeling good after a day of rest, updating my blog, and receiving a used can of bear spray from my host, Geoff. 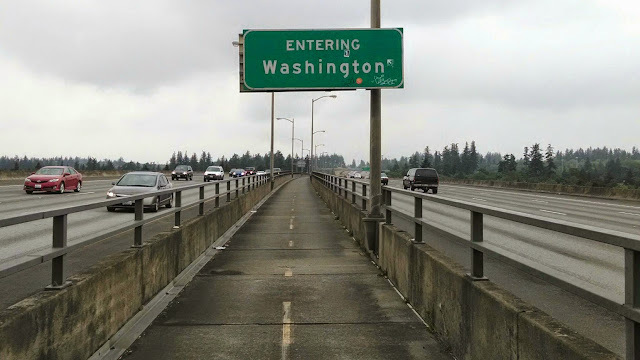 I had gotten some warnings that truck traffic would be bad, but I had no idea the next week of riding would be the worst riding of my life. 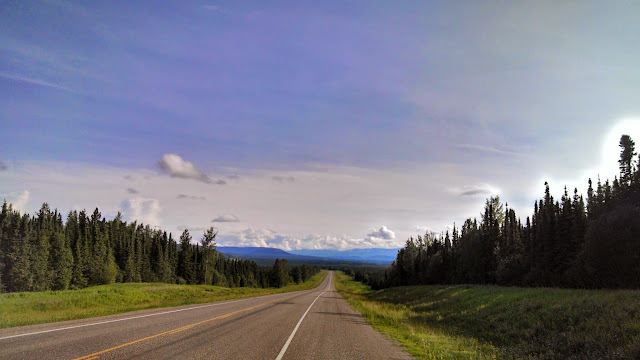 The Alaska Highway in northeast BC has been taken over by the oil and gas industry, and is now essentially a service road for their business operations, with some RVers and tourists mixed in. The recent boom is the result of fracking, and there doesn't seem to be any signs of slowing down. My first day riding south out of Ft Nelson was mostly very good though more remote than I expected. 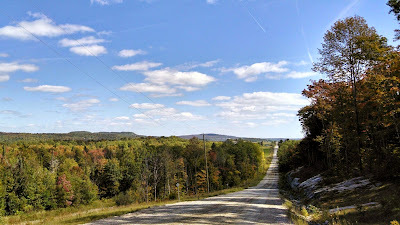 Low traffic, lots of bears along the road, and plenty of sunshine. The town of Prophet River is no longer, and the motel/restaurant/RV Park is closed. The river and creek water ran muddy brown so I was reluctant to try to filter the water with my pump. A truck driver gave me a bottle of water to get me further down the road. So the stretch from Ft Nelson to Buckinghorse River would be about 180KM with no services. The ride from Skagway, AK to Dawson Creek, BC, the start of the AK Highway, and south through Jasper and Banff National Park has been challenging, rewarding, beautiful and ugly. The first part from Skagway to Ft Nelson was exciting, and with the exception of some dusty roads and hot temperatures, a wonderful stretch of riding. 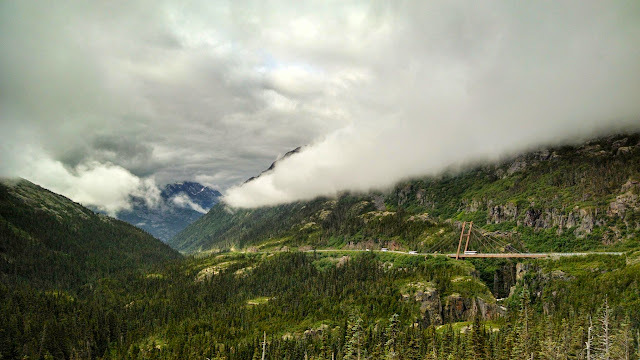 From Skagway I rode up the Klondike Highway over White Pass back into Canada. Above is the lookout near the top of White Pass on the Klondike Highway. Lots of tourists and buses driving up from Skagway giving me beeps and hand gestures of encouragement on my way up. Getting into Canada took longer than I expected. I thought the customs folks would just look at my passport. Instead the process took 30-45 mins and involved questioning, a background check, and proof that I had enough money to get back out of the country. Maybe a lot of cyclists stay and never leave. Remember Sharon, Matthew, and Ella from Joshua Tree National Park? They live in Delta, BC just south of Vancouver and welcomed me to their home. I ended up staying for several days and they showed me a great time with hiking, a tour of the city, hovercrafting, bonfire party, many delicious meals including an excellent sushi dinner, and an opportunity to get my bike ready for the remote riding ahead. I found a new pair of Schwalbe Marathon tires that have been treating me well since. 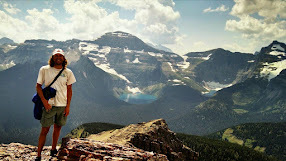 If all goes well I will run into them again in Glacier National Park in August. 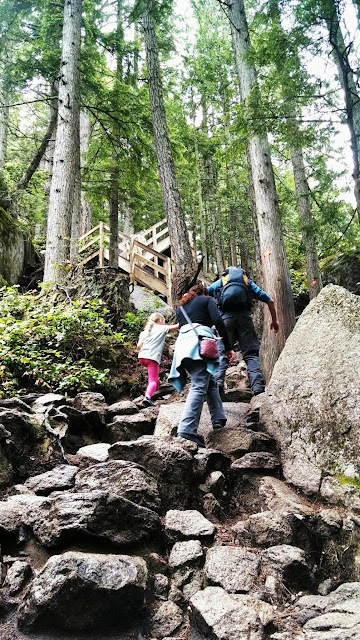 Out for an easy walk in the woods with the Glades in Squamish at Stawamus Chief Park. Squamish is north of Vancouver toward Whilster. 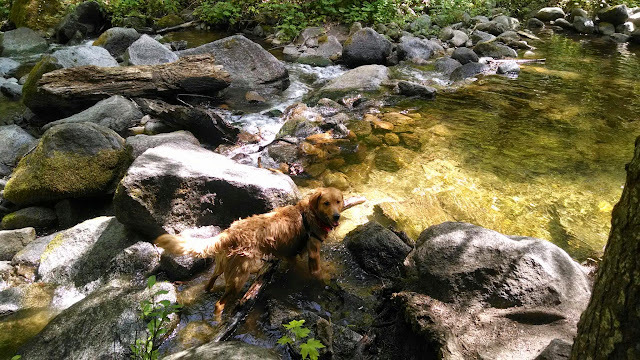 It is a very athletic and outdoorsy community. Despite the bad weather there were dozens of others on the trail. The coast north of San Francisco is as beautiful as the coast to the south. It is also sparsely populated and hilly, but has a greater diversity of landscapes and eventually transitions into the wet coastal forest. Since I took a week off the bike in SF I decided to do a couple hilly 80 mile days to get back into the swing of things. There is a good climb out of Sausalito, a fun descent down to Muir Beach, and then a Big Sur like up and down section into Stinson Beach. The riding through the Point Reyes area is more like a rolling country road, similar to New England riding, before heading back along the ocean on the Sonoma Coast. After seeing snow capped mountains in Lincoln National Forest east of Alamogordo, NM I decided to take the most southern, warm, and probably the most boring route through NM via route 9. Route 9 parallels the US-Mexico border and is used mainly by the Border Patrol. There really isn't any other reason to be there as far as I could tell. There are a couple small old railroad towns, Columbus and Animas, but not much else except a couple hundred miles of dust and the desert. 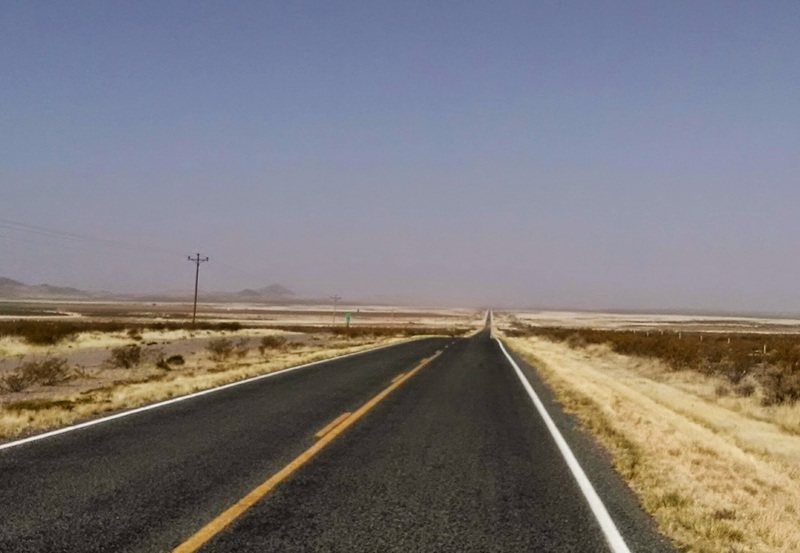 The lonely, windy, dusty Route 9 through NM, just a couple miles north of Mexico. For about 200 miles the most exciting thing is crossing the Continental Divide. 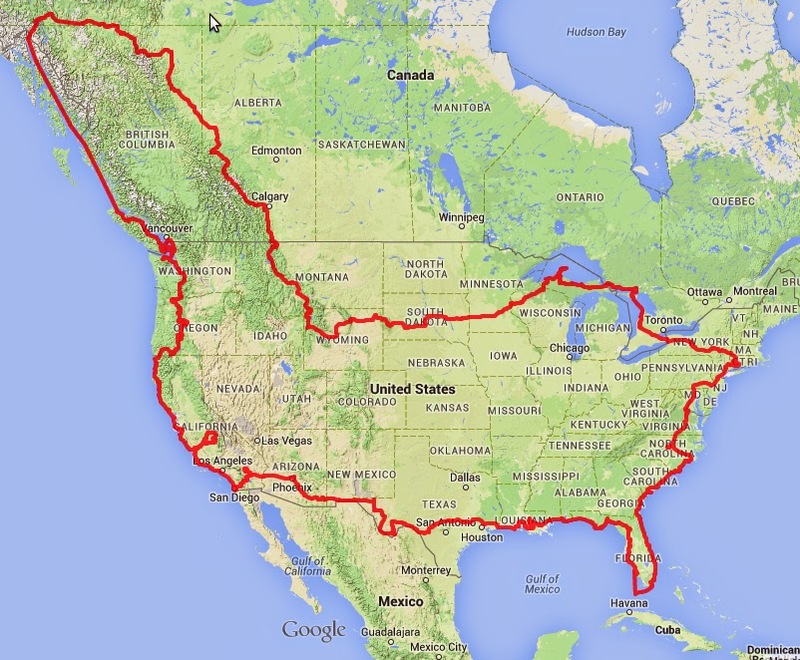 Texas is big. Texas gets hot, cold, windy, and remote. Texas is hard. I was in Texas for more than a month, logged over 1,300 miles, got sick 3 times, and of the 5 flat tires I've had since I left CT, 4 were on Texas roads. I spent many lunch breaks sitting on guardrails, the only place to sit for miles, trying to put peanut butter into a tortilla flapping violently in the wind. Fortunately, Texas has a diversity of beautiful landscapes and many wonderful people. I arrived in east Texas via Port Arthur and Beaumont, oil towns, and then rode on to Kingwood, a suburb north of Houston (the oil town), then to Montgomery, Carmine, and eventually to Austin. East Texas wasn't particularly exciting, but full of kind Warmshowers hosts, which I appreciate even more after riding through west TX and camping for weeks at a time. Riding through Beaumont I had to navigate around a sizable anti-abortion march in route to Jeff and Comeka's home. Jeff and Comeka treated me to pizza and football playoffs, a day of rest, and to my first Tex-Mex meal. Then on to Kingwood, which is suburban car land, and made me happy I wasn't getting any closer to Houston. My Warmshowers host in Kingwood, Nathan, recently did a tour himself and so has hosting down to a science. He has everything ready that a cyclist might ask for, including a little tray of extra toiletries in the bathroom labeled with a note to cyclists to help themselves, and had plenty of extra dessert. In Montgomery I camped out at my first bike shop, Lake Conroe Cycling. In addition to a couch, TV, dual headed shower, and hot beverages in the shop, Cindi provides an electric space heater for your tent on cold nights. Somewhere around Kingwood I started getting a cold. Leaving the bike shop the weather took a turn for the worse, with temps dropping throughout the day. After 75 miles of riding the scenic rolling hills to Carmine temps were in the low 30s with light rain. No chance of fighting off that cold. Fortunately, in Carmine there is a very special Warmshowers host. 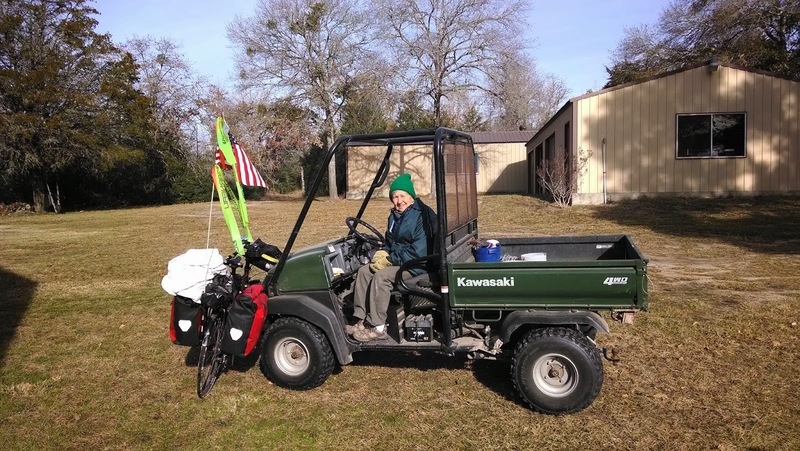 Carol, in her mid 80s, lives alone well off the beaten path on a small piece of property by TX standards (~100 acres). She has a barn with a bunkhouse which she has been using to host cyclists for years. After a cold night I awoke to frozen pipes and a coating of ice on the ground. So I spent a second night and had the pleasure of lending Carol a hand around the house. We went to a neighbor's to pick up a load of scrap wood, filled the tractors with diesel, I moved a microwave, burned some trash and kept the firewood supply coming. Carol was delighted with all we accomplished and gave me a special present. Carol is a woodworker, and carves children's names out of wood with letters that link together like a puzzle. She carved Madeline and Lily and mailed them to Connecticut. Reportedly, Madeline figured it out, but Lily is still working on it. Carol on a cold morning with her mule and mine. Mobile Bay Alabama is a transition point from beach world to industrial world. On the ferry to Dauphin Island from Fort Morgan oil platforms are visible in all directions, and from here until TX the petro-chemical industry everywhere, above ground and below (pipelines). I camped underneath a beach house on Dauphin Island with the 4 other cyclists. The beach was surprisingly nice, but I suspect the site and sounds of the oil rigs dotting the horizon keep most of the tourists in FL. 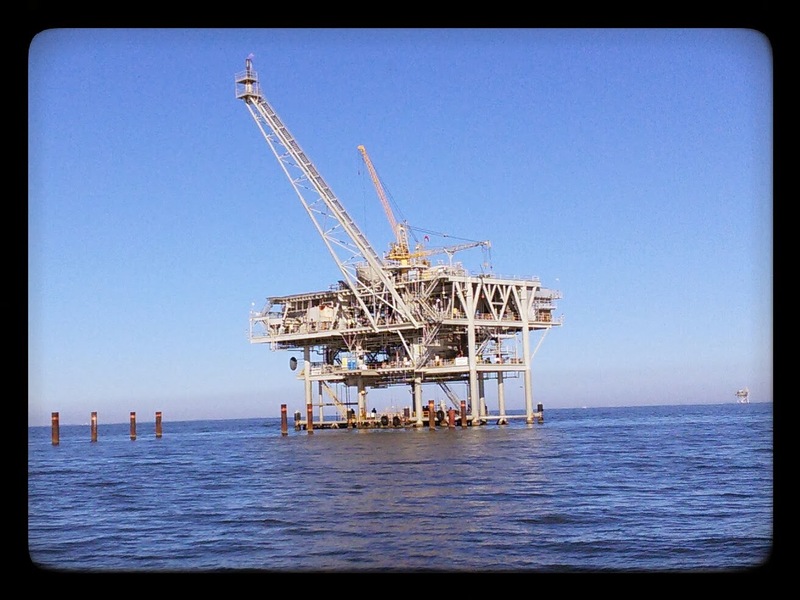 Oil rig from the Dauphin Island ferry in the Mobile Bay. As Curtis from Canada warned the quiet roads and nice scenery came to an end riding into Panama City. With about 30 mins to sunset I made it to Panama City Beach and stopped at a Publix not too far from the entrance of St. Andrews State Park. Supposedly St. Andrews is one of the nicest parks in all of FL. Unfortunately I never got to find out. In the Publix parking lot a guy named Kevin started talking to me and I had a hard time getting him to stop. Kevin is a salesman of sunglasses and $100 per bottle miracle anti-aging lotion. By the time I finally got back on my bike I had a free pair of sunglasses with "the highest optical clarity available" and miracle lotion on the back of my hands. I arrived at the St. Andrews park gate after sunset. The ranger at the gate informed me the cheapest camping they had was thirty something bucks, and despite the brochure saying otherwise, they had no primitive camping. She wasn't indicating any willingness to help me out so I rode away frustrated. North-central FL, the northwest coast, and the panhandle are a completely different world from the east and SW coasts. Somehow these areas have been spared relentless development, even along the beaches, and beautiful natural areas dominate the landscape. The ride north of Tampa and west along the gulf coast were a much welcomed change in scenery. My cousins from NY recently moved to the boondocks in Dade City, so rather than continue up the coast from Sarasota I rode inland. Once I got north of Tampa a wonderful thing happened: I looked up and saw countryside, and a hill that wasn't part of a bridge. Horses, cows, pasture, and orange groves were everywhere. I saw share the road bike signs and even crossed paths with a group of cyclists. After a 90+ mile day, I got a hearty meal of soup, a ping pong tournament and a comfy bed. I am so glad they gave me a reason to ride to that part of FL. Riding north the next morning two cyclists, Vinny and Jim, rode with me for a bit and took me out to breakfast. One of them founded the San Antonio FL bike shop. The area is apparently a cycling destination in FL. There is even a nice country bike path, which I followed north through Floral City, home to a recumbent specialist bike shop. I camped at Ft. Cooper State Park just off the path. 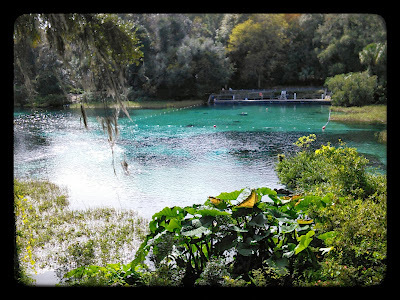 More nice country riding to Gainesville and along the way I stopped at Rainbow Springs State Park for a swim. What a good decision! The clearest water I have ever seen (120' of visibility I was told) and 72 degrees year round. 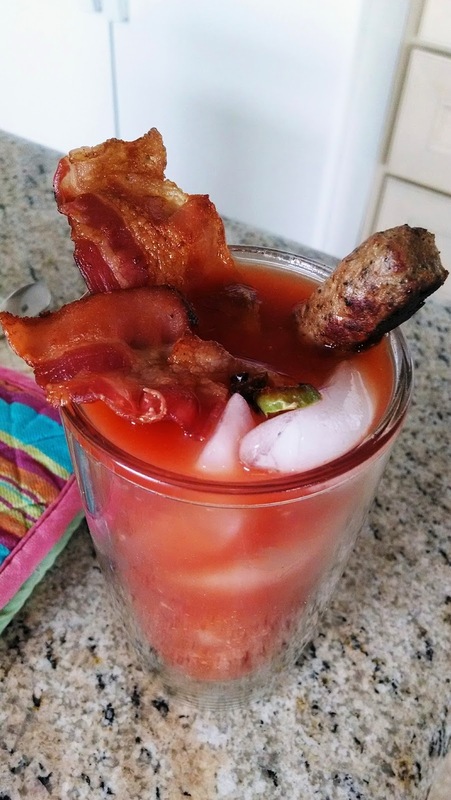 I would take this over the beach any day. The Key West Express ferry arrived in Ft Myers Beach after 10PM. My bike wasn't off the boat until around 11PM. 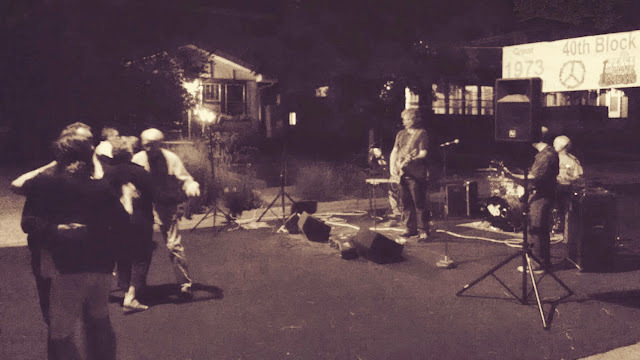 I didn't feel like riding 20-30 miles to the homes of the the people I met on the boat, and I suspected they wouldn't want to stay up until after 1AM getting me settled. So at 11PM, hungry, and with a seat soaked in saltwater I rode to a nature preserve a couple miles away that I had scoped out ahead of time. Along the way I saw an open hotel office so I stopped and asked how much a room would cost. $60. I decided I wasn't that desperate. The weather was windy, but dry and not too cold. The woman at desk said they were open all night if I wanted to come back.